If you’re traveling in Indiana, live there, or are just passing through I highly recommend visiting Spring Mill State Park! It’s one of my favorite places to visit with family year after year! It’s located south of Bloomington, about 3 miles east of a small town called Mitchell on Indiana Highway 60. 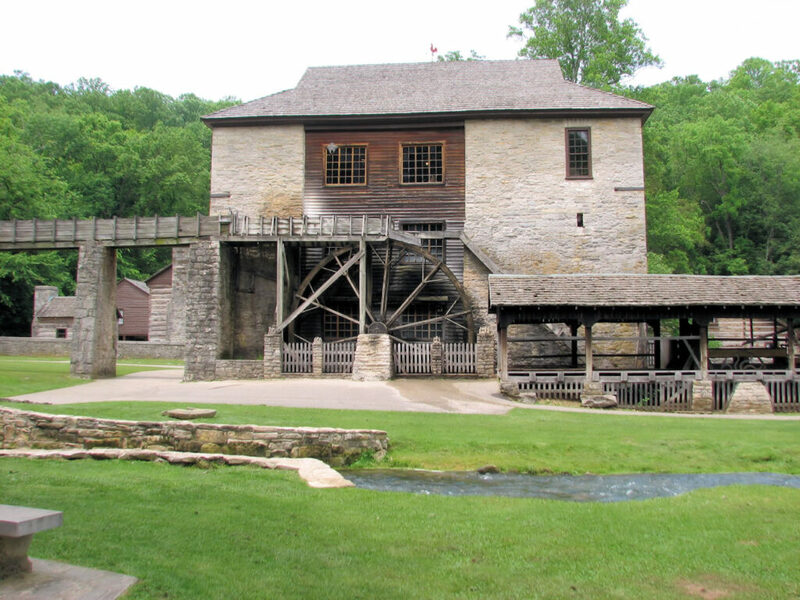 Spring Mill offers so many really cool things from caves to an industrial pioneer village from the early 1800’s. Pioneer businesses took advantage of the constant water source there that never froze and used it to power gristmills, a wool mill, saw and distillery. Around 20 buildings are all still there and you can visit each and every one. 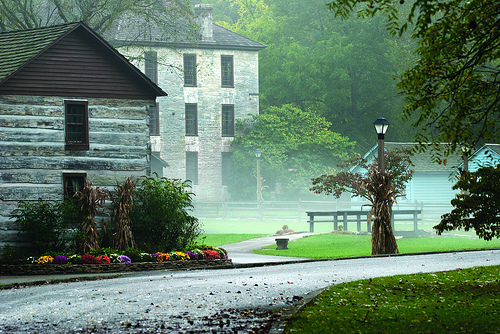 From the church (where Sunday morning service is still held) to old homes, the gristmill, and even the apothecary building. It’s the coolest thing ever to visit these primitive buildings. You can still buy fresh cornmeal that’s made right there at the gristmill and you can watch the grinding in action. It’s such a fun and educational experience for kids. To see the folks dressed up running the mills, spinning wool, woodworking…it’s just a phenomenal experience! Open Daily from May thru mid-October, 9:00 a.m. to 5:00 p.m.
Open Daily from March thru October, 10:00 a.m. to 5:00 p.m.
Open Daily Year-Round, 8:30 a.m. to 4:00 p.m. This memorial museum is in honor of Indiana’s own Virgil Gus Grissom, one of 7 Mercury astronauts and America’s second man in space!!!! Virgil Gus Grissom was from Mitchell and that’s why his memorial is here at the Spring Mill State Park. The memorial tells about his life and his part in the space program. 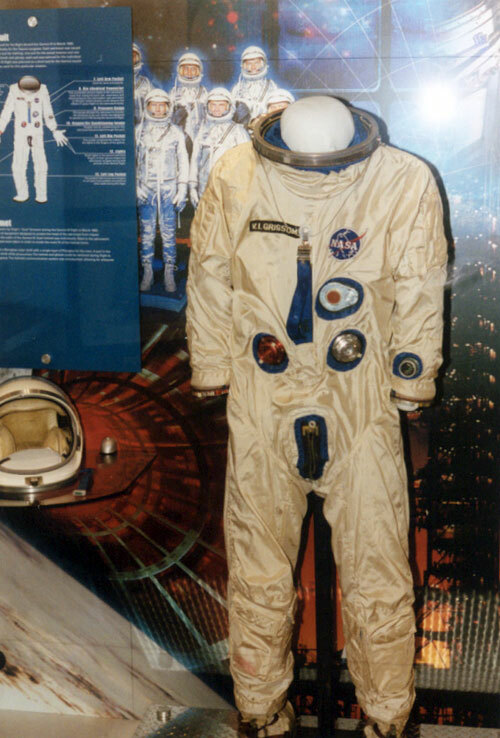 You’ll find his space suit on display, one of the capsules he flew in, and other artifacts. Open Daily from Memorial Day Weekend thru mid-August, 9:00 a.m. to 5:00 p.m.
Open Weekends from mid-August thru mid-October, 9:00 a.m. to 5:00 p.m. Besides these activities, you can also go hiking or biking along their trails, go camping or stay at the Inn if you prefer. They also have a public swimming pool, shelters and picnic areas, hayrides and a fun campstore. If you ever decide to stop through, leave us a comment! We’d love to hear what your family thought of the park! !